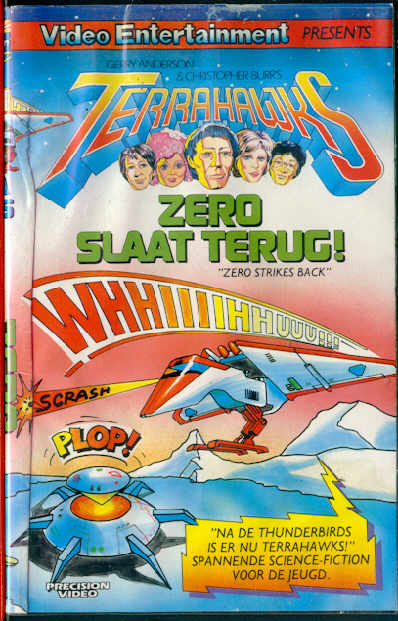 TERRAHAWKS COLLECTABLES, VIDEO TAPES - Dutch Tape #6. Dutch Release - Tape #6. By Precision Video - With Dutch sub-titles.Titled "Zero Slaat Terug!" Compilation of four episodes. "Gold" "Unseen Menace" "Zero's Finest Hour" "The Ultimate Menace"
The question I get asked most often is ... Where can I get the video tapes from? The answer I always give is this - Try eBay! the online auction site, you will regularly find the tapes listed for sale. This is the only place I could recommend you to look as the tapes are otherwise extremely hard to find. Click the link below to join eBay - it's free, it's fun, and it's where most of my collection originates!